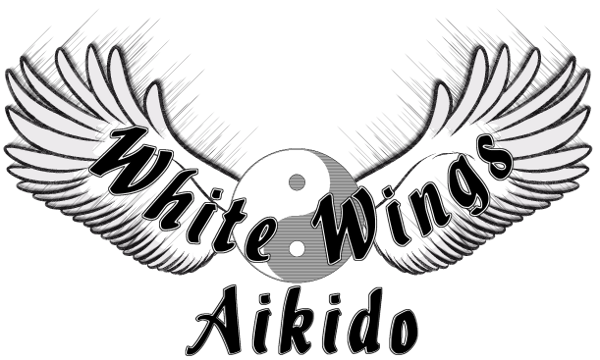 Welcome to the White Wings Dojo. Welcome to your first step of a long and rewarding journey. Beginners are welcome to observe any regular class. In a regular class a beginner may be paired with an advanced student, and will work on the same techniques separately from the class (though on the same mat), until learning some fundamentals, such as simple falls and rolls. Check with the dojo you visit on how to start your training. The dojo has a friendly, relaxed atmosphere. However, it is also a place of serious study, mindful of the martial arts tradition and purpose. The emphasis is on personal development and understanding, not on following a rigorous set of forms or memorizing complex kata. The training can be physically challenging, but is not necessarily so. Students work at their own level of physical ability and stamina, relaxing when necessary, challenging themselves when appropriate. Students are not goaded into pushing themselves to the extremes of their ability. Rather, students are asked to try to integrate their energy into the class. The result is a feeling of enjoyment and relaxation with alertness and clarity by the end of class. The entire dojo trains together in each class. There is no segregation by rank during practice: Beginning, intermediate and advanced students all practice together freely. The instructor gives individual attention to students throughout class. The emphasis is on controlling a physical encounter from the beginning through timing and motion, rather than by subduing an opponent by sheer force or speed. Proper breathing and posture are also important. There are some breathing exercises during class. Students are free to practice together after class, and help is always available from senior students. The dojo has many Black Belts (Yudansha), so abundant help is always available. What is Aikido? Aikido is a non-competitive martial art from Japan that emphasizes mind/body integration. Learn more by clicking on the About Aikido button. Who can study Aikido? Men and women of all ages can study Aikido, regardless of physical skill or previous experience in athletics or other martial arts. Training is always self-paced, and for the most part all ranks train together, with the more experienced Aikidoists helping the newer students. Why do people study Aikido? Aikido is never competitive, so the training is purely for personal development. Aikido is vigorous, weight-bearing exercise that improves your strength, coordination, balance and your overall health. The training also helps you develop alertness and a calm mind. Most people find that regular training reduces stress levels significantly. The most important reason to study Aikido, however, is to enjoy it! How do you begin? Just come by and join a class. We also offer classes especially for beginners. In the regular classes senior students give you individual help with the basics and work with you until you feel comfortable enough to train with the other students. To sign up just arrive at the dojo about 15 minutes early to introduce yourself and sign a waiver. Wear comfortable, loose clothing, or a gi if you have one. You are welcome to observe classes and talk with the instructor and other students before you decide to join. If you're interested in starting Aikido or continuing to learn in a different environment you can start by calling this number 01827 716100 or 07831 200540 and ask for Adrian.